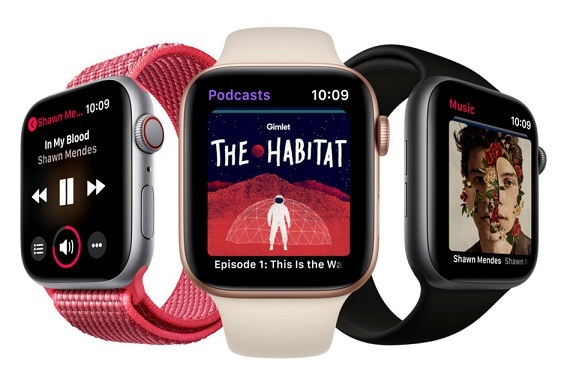 At its historic September 12 annual hardware event that took place at the company’s Cupertino campus in California, Apple unveiled a next-generation smartphone — the Apple Watch Series 4 or Apple Watch 4. Highly anticipated, Apple didn’t disappoint as the Watch Series 4 has been redesigned to include a wide range of health and fitness features that its predecessors lacked. With the Watch 4, looks like Apple is ready to displace whatever brand/product at the top of the smartwatch chart. Design-wise, the Watch 4 doesn’t bring on any major modifications to the regular rectangular shaped accessory we know Apple watches to have. Apple have, however, brought on a bigger screen for users who wished their current Apple watches had a bigger display. The Apple Watch 4 comes in two sizes — 40mm and 44mm. Also, bezels have been shrunk to make the display 30 percent larger than what you’d find on the Series 3 without affecting the size of the smartwatch to a very large extent. The display is curved at the edges while the face have corners which are curved to the sides/frame of the smartwatch. The slim bezels and curved edges gives the Watch Series 4 a slimmer appearance. Due to the slimmer architecture, the straps on the Series 4 are different from the Series 3’s. However, both straps can be used interchangeably. Meaning you won’t have to ditch your Series 3 straps if you plan on getting the new Watch 4. Another design modification is the digital crown which now allows for more accurate scrolling on the Watch 4. Apple calls it “Haptic feedback”. On the Watch 4, the position of the speaker and microphone have also been modified; the speaker is now 50% louder. The speaker is on the right-hand side of the watch while the microphone occupies the left side. They previously occupied the same on the Watch Series 3 and it caused interference during calls. 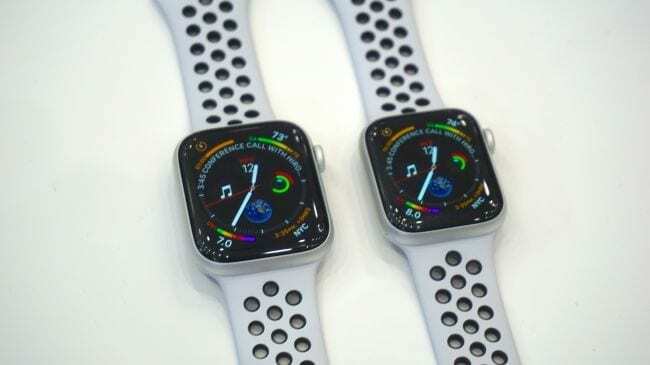 About calls, the rear of the Apple Watch 4 is made out of black ceramic and sapphire to improve cellular signal and call quality. The rest of the Watch 4 face is made from (either) stainless steel or aluminum materials. Aluminum model of the Watch Series 4 is available in Silver, Gold, and Space grey colour options while Stainless Steel edition comes in Space Black and Gold colours. The major highlight addition to the Apple Watch Series 4 are health-related. The biggest health function of the Watch 4 is unarguably the new ECG function. For the first time ever, a smartwatch will be able to accurately run an Electrocardiogram (ECG) test. For reference purpose, an electrocardiogram (ECG) is a test which measures the electrical activity of your heart to show whether or not it is working normally (BloodPressureUK). The digital crown and the sensors on the ceramic & sapphire rear allows users successfully run ECG. With the Watch 4 on your wrist, all you need to do is to place a finger on the digital crown. 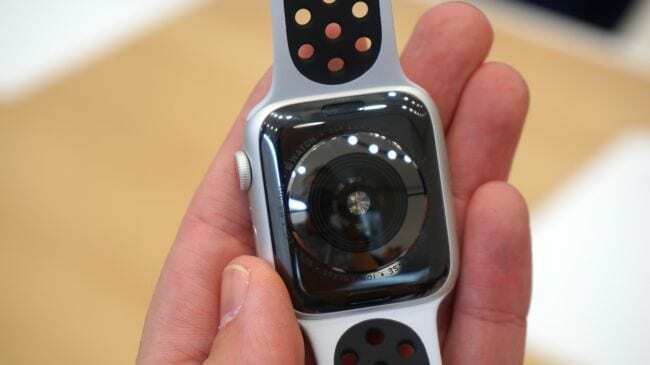 Approved and cleared by the Food and Drug Administration, the Apple Watch 4 is the first ECG device that will be sold directly to customers over the counter. It is worth noting that the ECG function requires a separate app which won’t be available until later. Apple hasn’t fixed any date yet but promises the app will roll out to the Watch 4 later in the year. Another interesting health feature of the Watch Series 4 is the ‘Fall detection’ function. Basically, the Series 4 comes with the capability to detect when you fall and are unconscious. The watch is smart enough to tell an unconscious person from a sleeping one through the movement of the arms. In the case where the watch detects unconsciousness, the Series 4’s next line of action is to automatically go into SOS mode and contact emergency services while also sending your coordinates/location to your emergency contacts. The Series 4’s heart monitoring functionality has also been improved to become more sophisticated. Unlike other series, the Watch 4 will now be able to detect low heart rates and irregular/abnormal heart rhythms. The Watch 4 is powered by and S4 processor chipset and laced with the new watchOS 5 preinstalled. Battery size on the Watch 4 is the same as the Watch 3 and Apple claims that it will also be able to supply 18 hours of usage. The Apple Watch 4 is presently available on pre-order only but official shipping will commence September 21. The GPS and Cellular model of the Series 4 will see for £399/$399 and £499/$499 respectively.